The mysterious allure of Ireland’s legends powerfully resonates through the landscapes of Meath. Man first settled here 8000 years ago and the county’s lush plans are replete with ancient Celtic monuments, castles and churches. 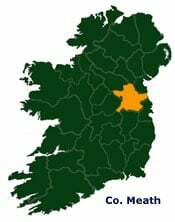 Known as the Royal County, Meath’s colors are green and gold-green for its rich grass pastures, gold for the High Kings of Ireland, who reigned there for centuries. For many, the sacred Hill of Tara embodies the very soul of Ireland – according to myth, otherworldly peoples like the Formorians and De Danaan struggled here for temporal and mystical power. From Tara the warriors of the Fianna rode forth to combat and St. Patrick embarked on his conversion of the Irish to Christianity. The Boyne Valley was the site of the historic battle of 1690 and is also home to many of Ireland’s most notable Neolithic sites, including Bru na Boinne with its 15 passage graves and the massive Newgrange, containing an inner chamber illuminated once a year by the rising sun of the winter solstice.